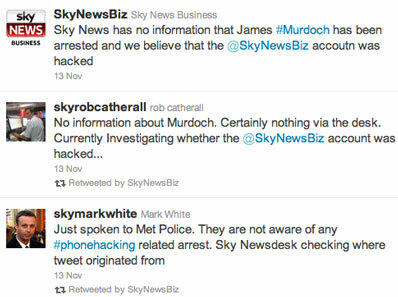 Hackers yesterday accessed the Twitter account for Sky News business desk and posted a tweet claiming that James Murdoch had been arrested by London police. It has also lately been used by hacker groups to simply raise their profile and make the public aware of their existence. Soon re-twitted by many followers, the fake news created quite a stir.The false tweet was erased within minutes, but not before other Twitter users had shared it across the network. Sky News is likely to find out soon whether the hack was executed by an insider - possibly as a joke - or by hackers.